A Dynamics 365 portal provides your audience an online location to communicate and collaborate. Depending on the audience that the portal is geared toward (such as whether it’s for customers, business partners, or internal team members), a Dynamics 365 portal can allow people to get support for issues, search knowledge guides and how-to guides, collaborate with communities, suggest new ideas, and learn more about your products and services. There will be no new hardware to procure, certificates to install, or web servers to provision. In a few clicks, your new integrated web presence is ready to go and waiting for you to mold it into the online game-changer we both know it can be. Dynamics 365 has four pre-configured Portal solutions. You can start with one of these and then add your own pages and business logic. Custom Portals come with minimal set of pre-defined page templates where you can start creating a Portal of your own per your tailored needs. Customer Self Service Portal is used by the customers of the organization. This portal is their own space of use where they can login and view as well as register their own support cases and manage the same. Along with that, Knowledge Base can be accessed and Forums topics can be started on this portal. Partner Portal enable business partner to build business by working on Opportunities of your organization. Community Portal serves to grow a community of people by sharing ideas, voting them and starting forum discussions about a certain topic. Just something to identify your portal instance. you can change this later. Partners – These folks might not be true employees but we want them to have some level of interaction with our CRM data to help deliver services or close deals. Customers – External folks who we can serve better by surfacing some things through an external portal such as customer service or community building. Employees – Support your own internal workforce though tailored portal applications such as Employee Self-Service. Note that you can check on the status at any time from your Dynamics 365 Admin center by opening the Solutions link in your instance. Observe that our customer self-service portal template is in the Installing phase. Once the Portal has been installed you can go back to into the Applications Tab and Click the Manage button for the Portal Add-on. Here you can configure the following portal setting and even restart the portal installation if you feel it was not completed successfully. 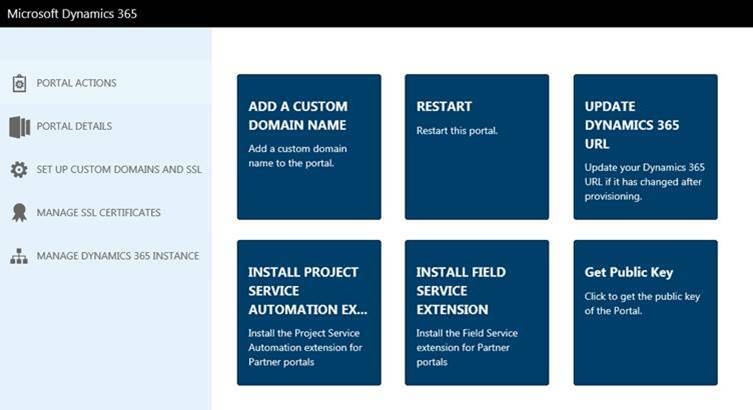 Once the Portal Solution is installed you should be able to see the solution installed and the Portals Application menu appear in the Dynamics 365 menu. In order for your User account to configure the Portal you will need to assign the Administrators Web Role for the corresponding Portal Contact record that is created during the installation. Navigate to the Dynamics 365 Contacts, you should be able to find the Contact record that corresponds to your user account. The Portal Contact form will have a Web Roles tab, Check it has the Administrator Role, If not you can add the web role as shown below. Now that you have assigned the Privileges to your Portal User, Clicking the Sign in Button on the Portal homepage, and pressing Azure AD will allow you to sign in with your Office 365 logged in credentials. Now that you Portal User account is configured you can login to access your Portal Site and Portal Configurations in Dynamics 365, you can begin customizing your Portals. Logging in with your Portal User Account configured with Administrators Privilege will display the Wizziwu widget in the top right corner allowing you to edit the Portal forms, you can use this to directly edit the pages.